The Arlington County Board today took several actions in a coordinated effort to enact the vision outlined in the Western Rosslyn Area Plan (WRAP), which was adopted by the Board in 2015. 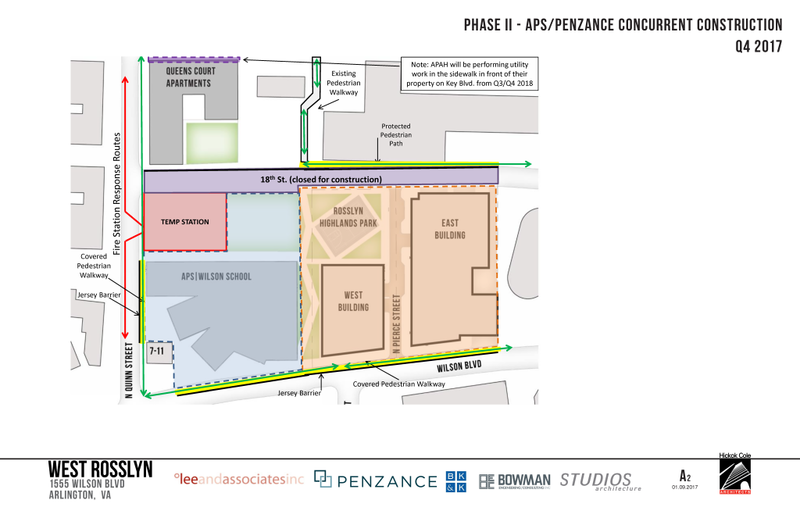 The approval of several use permits and site plans will deliver a new school, new fire station, transportation network improvements, parks and open space, affordable housing, retail and new residential space to the Western Rosslyn community by 2021. 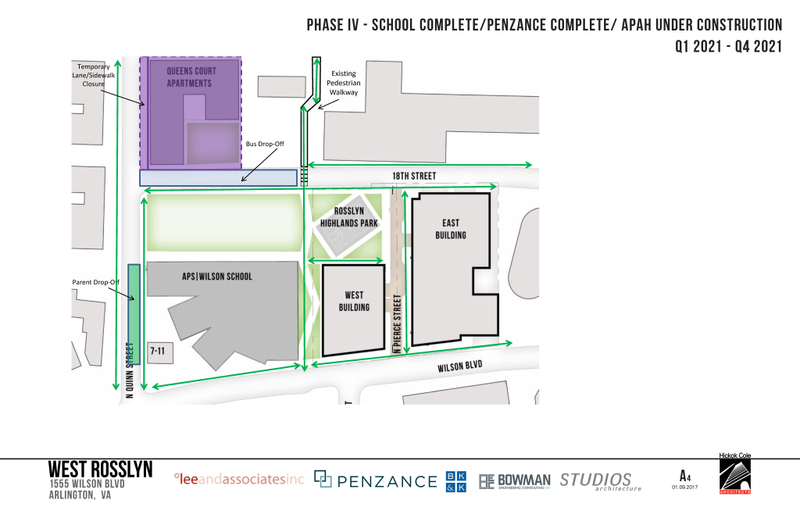 The approval of the complex redevelopment plans in a relatively short timeframe were made possible through the joint efforts of property owners – Arlington Public Schools, Arlington County, Penzance and Arlington Partnership for Affordable Housing – in conjunction with significant input from community members and stakeholders. Wilson School at 1601 Wilson Blvd. 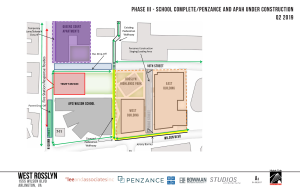 – approved a use permit for an approximately 180,000 square foot school designed for 775 students with modification to setbacks, height and parking regulations. 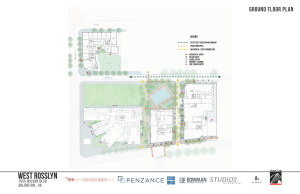 Penzance development at 1555 Wilson Blvd. – approved a site plan for two multi-family residential buildings with underground parking, ground floor retail and a fire station; approved a use permit with a site plan for a new Rosslyn Highlands Park; approved a General Land Use Plan (GLUP) amendment for the central area of the block; and a rezoning to achieve site plan goals. Queen’s Court Apartments at 1801 N. Quinn St. – approved a site plan, GLUP amendment and rezoning for an affordable housing development by Arlington Partnership for Affordable Housing (APAH) with 249 committed affordable units. The Board voted 5 to 0 on all the actions. To read the staff reports for each item, view Items No. 26-28 on the Agenda for the February 25, 2017 County Board meeting. The Western Rosslyn Area Plan (WRAP), adopted by the County Board in July 2015, envisions redevelopment of the Western Rosslyn area with affordable housing, a new Rosslyn Highlands Park and other publicly accessible open space, high-density mixed-use development, a new fire station and a new school. 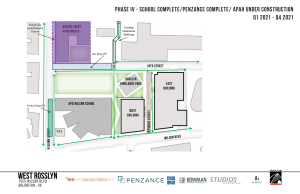 Other key elements to facilitate redevelopment include the construction of a new north-south street (N. Pierce Street) and the reconstruction and regrading of 18th Street North. The anticipated construction schedule of the key elements approved today begins in 2017 and concludes in 2021. To learn more about the Western Rosslyn Area Plan, visit the County website. The County Board approved a use permit for a new Wilson School and associated structures at 1601 Wilson Blvd. that will replace the existing school building. The new, 775-seat school will be home to the H-B Woodlawn Secondary Program, the Stratford Program, ESOL/HILT and Asperger’s Program. The project is part of the School Board’s 2015-2024 Capital Improvements Plan (CIP) which includes funding for a new secondary school to open by September 2019 in order to accommodate increased enrollment. The design includes a five-story building approximately 76 feet in height. An athletic field is proposed directly north of the school. 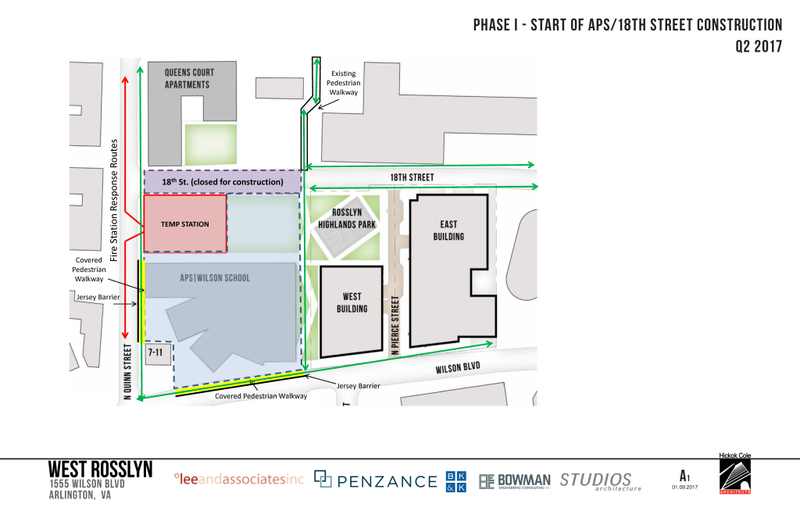 There will be 100 permanent dedicated parking spaces provided in the private redevelopment project (1555 Wilson Blvd.) directly adjacent to the site. 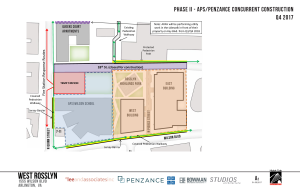 The approved site plan at 1555 Wilson Boulevard is for a 2.72-acre site currently owned by Penzance and Arlington County. The project will replace an existing commercial office building, Fire Station No. 10 and Rosslyn Highlands Park with two multi-family residential buildings, underground parking, ground floor retail, a new fire station and a redeveloped Rosslyn Highlands Park. A public-private partnership between the County and the developer will leverage the private development at 1555 Wilson as a means to offset the costs of construction a new fire station, street and park. The East Building, at 27 stories tall, will include 561 new apartments, 20,513 square feet of retail and Fire Station 10. The West Building, at 23 stories, will include 331 new apartments, and 9,547 square feet of retail. Underground parking will include 1,050 spaces including 100 reserved for school use. The approved Queen’s Court site plan, located at 1801 N. Quinn Street, includes a 12-story apartment building with 249 committed affordable units (CAFs) which are contracted to be affordable for at least 60 years. Two below-grade parking levels will include 150 spaces. 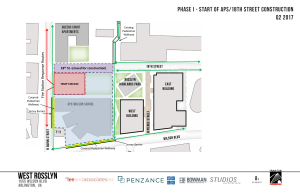 The developer, Arlington Partnership for Affordable Housing (APAH), is also providing a 9,000 square foot public park easement to achieve the public playground as recommended by the WRAP and the Rosslyn Highlands Park + Coordinated Open Spaces Plan. In a phased WRAP construction sequence, the temporary fire station will be located on the school’s future athletic field while the new, permanent station is built at 1555 Wilson Blvd. In September 2016, the County Board accepted the County Manager’s recommendation to use this location, after extensive public engagement and examination of two dozen potential sites. To learn more about the temporary fire station site selection process, visit the County website. The County Board approved a conceptual design for the new Rosslyn Highlands Park in September 2016. The vision for the dynamic recreational space, as outlined in the WRAP, integrates three fragmented pieces of open space into the redeveloped Rosslyn Highlands Park. Major elements include a multi-purpose court, children’s playground, lighted athletic field, rooftop terrace, planted green areas and integrated seating. The park will be built in three phases, in partnership with the property owners. The FY2017-2026 Capital Improvement Plan shows a total project cost of $9.28 million. 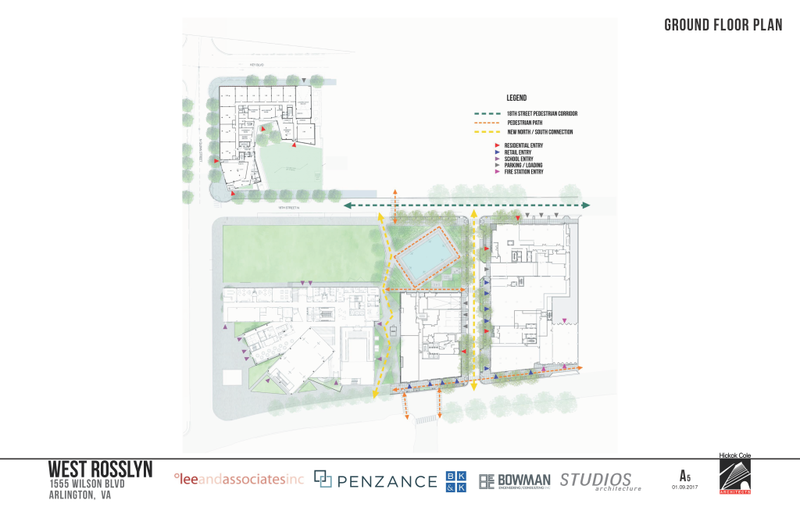 Learn more about the Rosslyn Highlands Park+ Coordinated Open Space plan process. Additional project reviews took place with the County’s Site Plan Review Committee, Public Facilities Review Committee, Parks and Recreation Commission, Historical and Landmarks Review Board, Urban Forestry Commission, Environment and Energy Conservation Commission, Transportation Commission and Planning Commission.